We’ve heard heard it time and time again that kitchens and bathrooms sell homes. If you’ve ever lived through a kitchen or bathroom remodel in your Utica, NY home you know why that is: they’re expensive, they’re time consuming and they’re terribly inconvenient. Whether you’re planning to sell, you’ve recently purchased a new home or are just looking to update your current bathroom, New York Sash can help you to both improve the aesthetics and the value of your home. If you’ve started researching a bathroom remodel you’ve probably already discovered that the national average cost for a complete bathroom remodel exceeds $10,000 and takes just over three weeks to complete. Especially for those with only one full bathroom in their home, this is an inconvenience that many of us cannot endure. The logistics of completing such a project can be nightmarish. 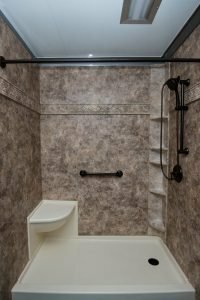 With acrylic bath liners, wall units and accessories from New York Sash, however, your bathroom remodel can be done in just two days, limiting your downtime. In addition to being a convenient and cost effective alternative to a complete, to-the-studs remodel, partnering with New York Sash also allows you to divide and conquer the bathroom remodel in your Utica, NY home. If a complete refresh is out of the budget for now, tackling the tub/shower combo (undeniably the most expensive, time consuming and messy part of the project) first and then revisiting the project when finances allow to tackle the toilet, sink, lighting and accessorizing makes the cost of the entire project more palatable. At this point you may be wondering how all of this is possible and in just two days. You may also be concerned about quality, aesthetics or price. The concept is simple, really. Without disturbing any of the current plumbing (which of course keeps the cost down significantly) a brand new system is placed right over top of your current setup. You can rest assured that your bathroom remodel will be completed with only the highest quality materials that are easy to clean, attractive, durable and will provide you with peace of mind for years to come. The wide range of color and design options that we offer is sure to suite any decor. Are you still unsure if an acrylic system from New York Sash is right for your Utica, NY home? Stop into our showroom conveniently located in Whitesboro at 349 Oriskany Blvd. and let one of our helpful associates show you what we can do in just two days.